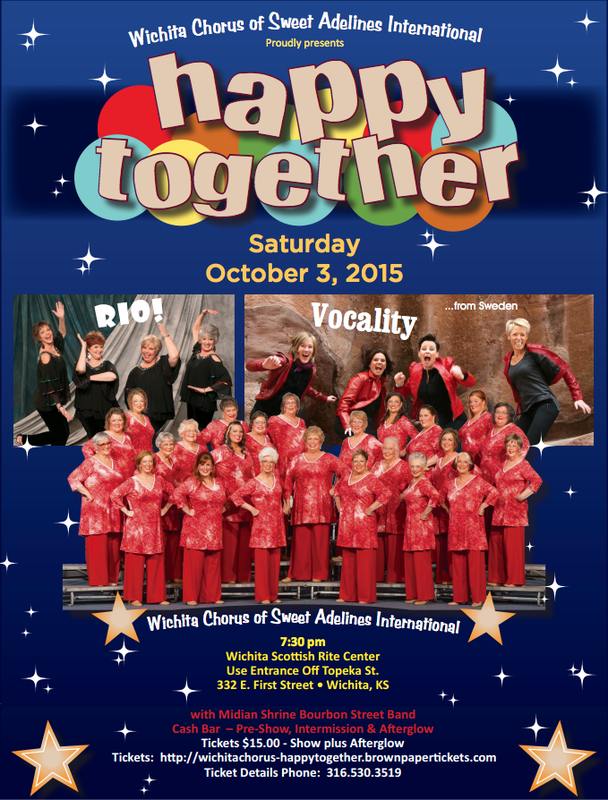 The Wichita Chorus of Sweet Adelines International (WCSA) proudly presents its 64th annual show on Saturday, October 3, starting at 7:30 p.m. at the Wichita Scottish Rite Center (enter off of Topeka Street). Under the direction of Melynnie Williams and fresh off a first place win in Division A at 2015 regional competitions, the 30+ member chorus will present songs in traditional four-part barbershop harmony. Joining the chorus on stage are two internationally ranked quartets, Rio! and Vocality. The Midian Shrine Bourbon Street Band will also be performing. Please join us for an evening of fun, music, and most importantly being Happy Together! Tickets cost $15 per person and can be purchased here or at the door on the day of the event. The cost of admission includes both the show and afterglow. A cash bar will be available at pre-show, intermission, and afterglow. I can’t wait for this wonderful evening of song and joy! It is going to be such a pleasure to sing on stage with these beautiful women!